MBALE – Once dubbed “Cleanest town in East and Central Africa” Mbale has over the years gone into oblivion. Garbage, poor road network and illegal unplanned buildings, controversial leasing of plots even flower gardens all connived to the town’s detriment. “We had a big problem of garbage management, it littered everywhere, you would see polythene bags at every corner and heaps of garbage but all this is behind us now with the 300,000USD World Bank garbage composite plant,” said Ms Rhoda Nyaribi, the Municipal Environment Officer. Although the long term vision for Mbale Municipality leadership is to restore the former glory of the town and achieve city status, the settlement has been grappling with solid waste disposal, which has been aggravated by the increased population occasioned by the illegal unplanned buildings, territorial expansion and more attractive services. The town once known as the cleanest town in East and Central Africa has almost turned into a village where irresponsible residents use polythene bags as toilets [flying toilets] thereby making the town a centre for the outbreak of cholera, dysentery and other related diseases. The garbage composite plant for Mbale Municipal Local Government Council is now complete and has started work increasing the chances of getting a city status. 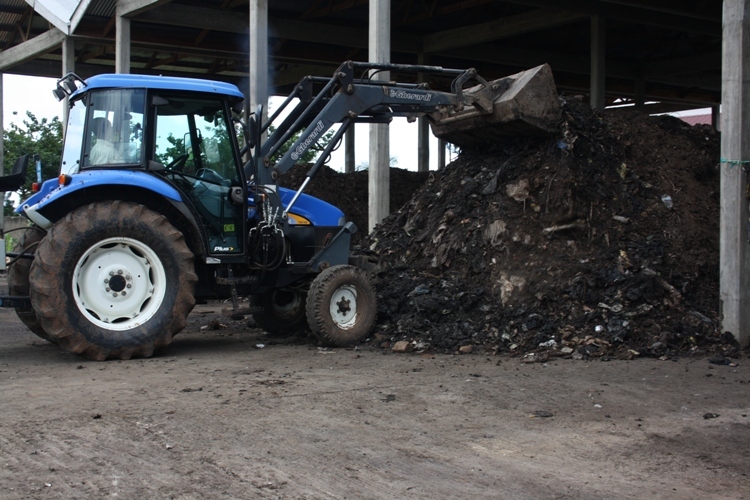 The municipality’s population generating over 100 tons of solid waste was previously collected by trucks for dumping at a site in Doko Industrial division thereby allowing it to degrade the land and pollute the air, but the construction of the compositor which turns the solid waste into manure is now greatly checking the hazardous impact on the neighbouring communities. The garbage that has been a menace is being turned into a blessing in form of manure which is sold to the farming community, therefore helping generate some income for Mbale Municipality. She revealed that at the composite site sorters pick out the visible non-degradable materials like polythene, textiles, plastics for the damp site and that what remains both degradable and non-degradable is put into windrows. The data entry clerk at the composite plant Ms Joyce Ayo says that because garbage which is brought at the composite plant is rotten and smelly and usually attracts flies, they use a mixture of cow dung and water to spray on the heaps to reduce on the smell and wade off the flies. “It will be more valuable if it is converted into an organic fertilizer by means of composting prior to its application on farm land. In making organic fertilizer, microorganisms involved in the fermentation process require water for their life and activities. This explains why water is important in this process and cow dung is important at this stage too,” said Ms Ayo. She revealed that the heaps that are in windrows are energised using a set of preparations that both enhance the nutrient content of the compost and hasten the decomposition process and that in these processes, low temperatures are required as much as possible. “In the decomposing wastes, we monitor the temperature of Methane using a Thermometer because fresh wastes have a high temperature about 70 degrees Celsius which can burn crops once applied directly while the decomposing waste has low temperature. We also measure moisture levels and keep spraying with water or leachet to lower the temperatures between 50 to 70 degrees when the heaps are ready,” said Ms Ayo. Site engineer Mr. Johnson Masaba says that after this state sorting starts and that leach [Waste fluids] that flow from the garbage is collected at a fenced bay and sprinkled over the garbage. The leach contains bacteria that speed-up decomposition. 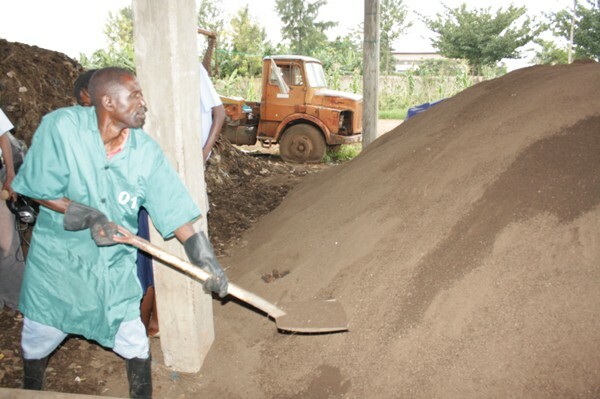 Mr. Masaba says the turning of garbage after six to eight days before completing the process, manure is sieved using a wire mesh yielding the fine particles of manure that are packed into 50kg bags after about 30 to 40 days toil. Besides selling it at Shs 100 per Kg to farmers within the locality who grow tomatoes, cabbages, onions, matooke and eggplants, the manure has been used in demonstration gardens at site and in the municipal council flower gardens. Ms Nyaribi said the town is also becoming clean by day as garbage is collected on a daily basis and that besides the composite site has provided employment to many people. Ms Nyaribi says that there is modern technology to treat the waste and turn it into compost and that the municipality in conjunction with National Environment Management Authority has also built the capacity of the municipal council to manage solid waste as a way of reducing greenhouse gas emissions into the atmosphere. “We collect about 100 tonnes of garbage daily in the municipality at collection centres, it is then placed in skips and then municipal garbage collection vehicles take the garbage to the composite site,” said Ms Nyaribi.